Original post date July 15th 2015. Erin Marshall, one of our great RMT's here at Axis Registered Massage Therapy is now offering a new specialized massage therapy service that goes beyond traditional massage therapy to target a specific system within our bodies. Myofascial Release (MFR) is a soft tissue technique that engages our body's fascial network that integrates into all the muscles and joints in the body. As with traditonal massage therapy MFR is also covered by many extended health care plans,when it is performed by a Registered Massage Therapist. 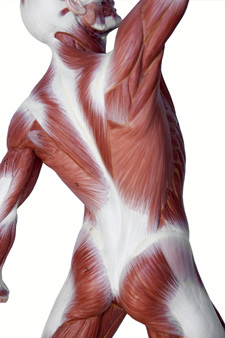 Fascia is a tough connective tissue, composed of an elasto-collagenous complex. This complex creates a 3-dimensional web which extends CONTINUOSLY from the top of the head to the tip of the toes, without interruption. It surrounds and infuses with every muscle, organ, bone, nerve and blood vessel all the way down to the cellular level. Fascia is continuous within the body but thickens in distinct areas such as the lumbar region (Thoraco Lumbar Fascia) and the lateral thigh (IT Band). What is its role in the body? Fascia can lose its pliability and become solidified, shortened and restricted, creating a source of tension in the rest of the body. These restrictions are often the result of trauma and the inflammatory process that follows. How is a MFR appointment different? Soft tissue work is done WITHOUT LOTION OR OIL, to gently and superficially access and then release the restrictions within the collagen of the fascia. Basically, MFR is releasing the “tourniquet” around the muscles, nerves and blood vessels. All of these are SLOW, GENTLE and RELAXING. These qualities make MFR a great alternative to traditional massage which can be sometimes painful, or overly stimulating. What is the MFR process? Clients are encouraged to bring shorts(men/women) and sports bras(women) for treatment. Minimal draping is used for the MFR treatment. Treatment lengths include 60 min, 75 min and 90 min. In this time Erin will perform a brief assessment, create a treatment plan, apply the MFR Techniques and prescribe any necessary follow-up care, including exercises, stretches or hydro-therapy. Often with a physical release in an MFR treatment, there may also an emotional release. If this occurs Clients are encouraged to talk to their therapist about their experience having MFR.